This is Leroy Smith, too. Smith is the Director of South Carolina's Department of Public Safety. He was working the state capital that day, along with bunches of his officers. They were doing crowd control for the rallying New Black Panther Party members who were cheering the removal of the Confederate Battle Flag and shortly afterward the rallying Klansmen and National Socialists on the other side of the building protesting the Battle Flag's removal. Just another 100 degree July day in the trenches of our continuing racial divide. But, some of the neo-Nazi's, apparently weren't used to Palmetto State summers. Master race, perhaps, but taken down by the heat. Dan Barry in the Times. Bike-rack barricades had been arrayed to separate the white-supremacist demonstrators from a swelling crowd of people, some fresh from the black-empowerment rally on the north side. 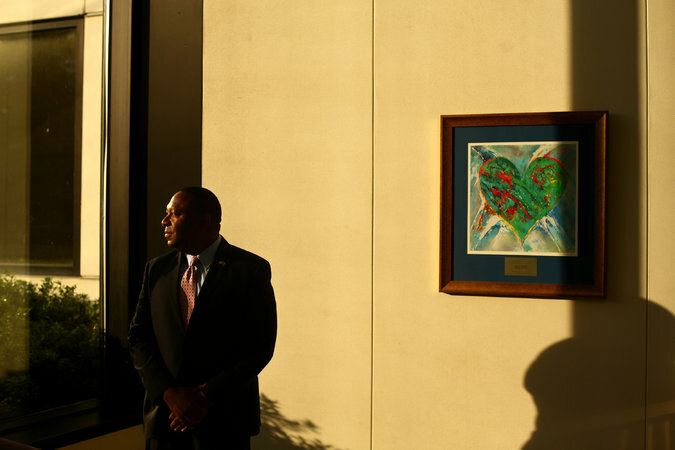 “You could kind of feel the tension in the air,” Mr. Smith recalled. Smith said that's when a protester approached, saying someone needed medical help. Smith and Columbia Fire Chief Aubrey Jenkins, who also is black, responded to a demonstrator overcome by the heat. The first white demonstrator they helped climb the steps and enter the air-conditioned Statehouse could walk on his own. The second clearly could not, Smith said. "He was struggling, fatigued, appeared to be lethargic. I knew there was no way he could make it up the steps on his own," Smith said. So Smith coached him up the steps, putting his right hand on his arm and his left arm around his body. Smith helped him up the stairs, encouraging him, took him into the capital where it was air conditioned. Sat him down to recover. Rob Godfrey, the Governor's Deputy Chief of Staff, took the picture and sent it off by twit. Where it went viral. 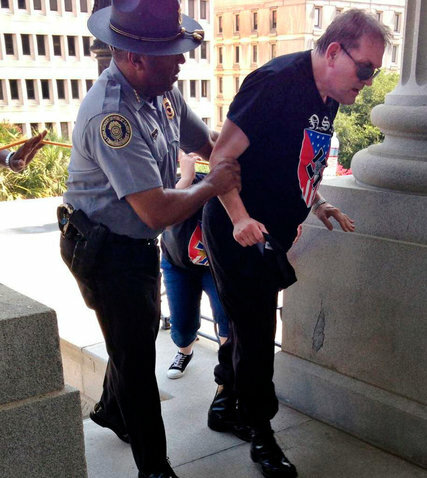 There's something about that photo: The black cop helping the ailing white supremacist. Dan Barry again. Asked why he thinks the photo has had such resonance, he gave a simple answer: Love. Those of you who hang around these posts know that I believe deeply in, and marvel at, mercy and grace and the mysteries of the human heart. Leroy Smith talks of the power of love. I suspect if you really pinned him down he'd say he was just helping someone in need because, well, that's his job. And it's just the basic thing you do. Except, of course, that mostly we don't. I think the reason we all like reading posts like this is because among the scores of posts about black kids being beaten, maimed, and killed by police with the requisite smear and coverup on a nearly daily basis, stories like this give us hope that there are still excellent cops out there who are professional, do right, and became cops for all the right reasons. At least it lets us know that all cops aren't just indifferent, at best, toward the citizens they serve. That, and who doesn't appreciate love and irony wrapped up in one awesome picture? Damn. I should have called the post Love and Irony.